It started with the meeting of two unique minds, Anna Deirvi-Castellanos and Lenore Estrada bonded at an early age at choir practice. 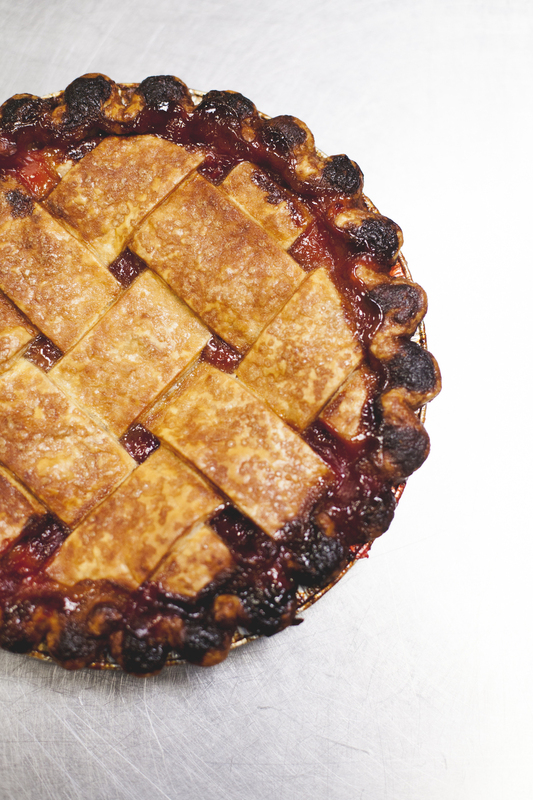 Raised to respect the environment, their community and quality, sustainable ingredients, they grew up baking delicious pies, and the seed of an idea was planted. Anna always knew she would work in the food industry and was determined to educate herself on everything there is to know about it. 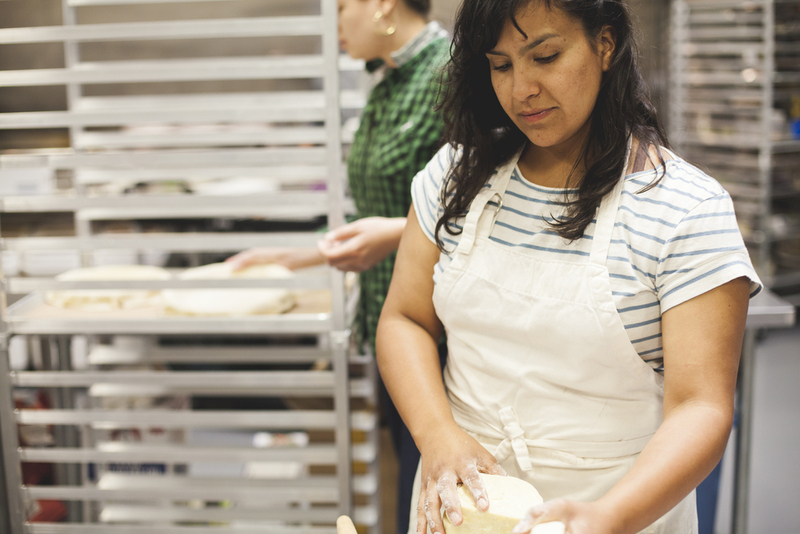 She worked her way up from the bottom at a small chain of natural food stores before going to culinary school and attempting to open her own Mexican eatery. Few paths are simple and things didn’t go as planned, but fate intervened and her best friend Lenore - who recently shared her story with us - moved back to California from New York, excited to start a new venture. A brainstorming session prompted them to try to bring their childhood dream, to start their own food business together, to life. 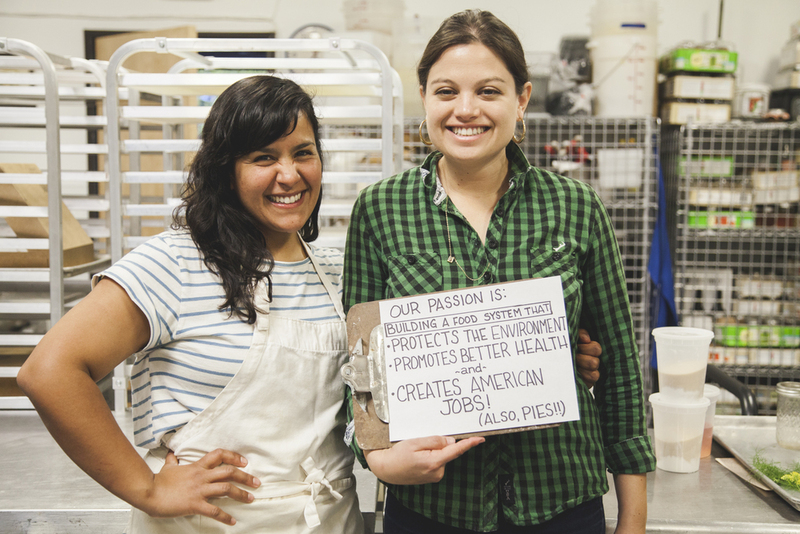 Eager to share their talents, principles and values with the rest of the world through pies made from fresh, locally sourced ingredients, they started Three Babes Bakeshop in 2010. "My 'passion' is really an extension of the values I was raised with: an interest in food issues and in agriculture. That means growing food and examining the ways that food production affects our lives – irrigation, the use of chemicals, and the way that these things affect the environment and our health. My parents were the first and most important people to show me by example how food can be a way to bring people together and create community." "After I graduated from college I moved to Santa Cruz, where one of my best friends from childhood was living, and was a shopper at New Leaf Community Markets – a small chain of natural food stores. I was really inspired by their mission of promoting organic and sustainable practices and by the ways they created community through food by partnering with local non-profits and educating their customers. When I saw a posting for a job on their bulletin board, I thought that joining their team might be a good way to engage in my interest in food issues and I applied for the position." "I knew that I’d need to work my way up, so I jumped right in! I worked all the jobs at the store, starting as a cashier and then working as a produce clerk and even as a sandwich maker in the deli. Eventually I was given more responsibility and took on roles in accounting, HR, and community marketing. I left for a while and went to culinary school, and eventually I even moved to Richmond, Virginia to start my own Mexican restaurant. Every role I had was a learning experience." "I’ve been fortunate to almost always work in the food industry, so my transitions have been between projects I’m passionate about, rather than from a 'traditional' job to a passion project. Still, transitional periods are always scary." 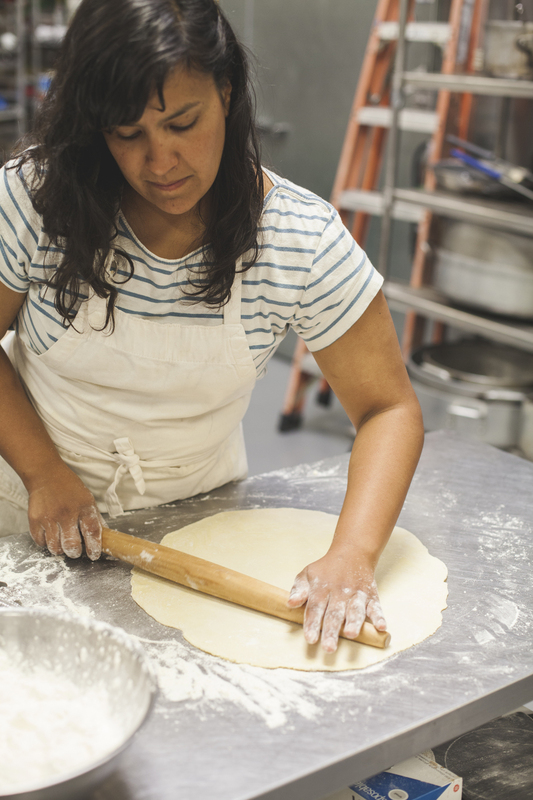 "When I decided to open a restaurant in Richmond with two friends, I moved across the country, got a job to support myself while we got the restaurant up and running, and then realized rather quickly that it wasn’t going to work out. Within six months, the project failed and I decided to move back to California. I felt so disappointed and embarrassed, but I learned a lot from the experience. Namely, that it’s important to have a well-defined plan before sinking a lot of money and time into something." "If you’re trying something you don’t yet have expertise in, it is often a good idea to take small steps toward your goal. When we launched Three Babes in San Francisco, we were much more professional than when I’d launched my first project. Still, we were cautious and rented a kitchen and a sales space rather than purchasing anything so that we could test the concept before going full-bore." "Like with everything, sometimes when you fail it just means you have to regroup and try another route to get where you want to go." "My former boss from my first job in food (the co-owner of New Leaf) is now an important mentor to me. At various points in my career I’ve truly appreciated his advice and support. Additionally, the food community here in San Francisco is very supportive. It’s a wonderful group to be a part of." "My biggest fear about living my passion is not being able to achieve our big dreams and being left with a disappointing business, and the feeling that I wasn’t able to reach my potential. It’s hard to explain because from the outside, many of the people we speak with see us as this huge success, but in the end each person has to judge his or her successes and failures. Reaching our goals can seem very daunting." "I overcome my fears by working hard every day. Sometimes the only way to get past a problem is to get past the problem. When you apply yourself you really up the chances that you’ll be successful." "Money has always been difficult in our business. We were lucky to be able to raise initial funds on Kickstarter and not give away a portion of our business right away, but for the first two years we were in business, we couldn’t even pay ourselves. I worked two jobs (first at a natural foods co-op here in San Francisco, and then as a host at a restaurant) so that I’d have enough money for rent. Eventually we had enough income to pay ourselves, but it’s been tremendously difficult, and still is." "When you have your own business, it’s easy to let self-care get stuck on a back-burner. I try to make exercise and spending time with friends and family a priority, and (despite the fact that we own a desserts business) to eat healthfully." "My parents are a huge inspiration to me. They have their own small business in Stockton and have worked so hard. They also are very involved in trying to build a better community in the Central Valley, and I really credit them with instilling in me a feeling of responsibility to creating a better world." "Go for it! But also, before you make your passion your full time job, really make sure it’s something you want to do day after day. Your best path may be devoting more time to a side project as opposed to making a career shift. Be sure that you truly understand what you need financially and emotionally from your career and be honest with yourself as to whether your passion can actually provide that for you."